Donald E. Knuth wrote:All rights reserved. No part of this publication may be reproduced, stored in a retrieval system, or transmitted, in any form, or by any means, electronic, mechanical, photocopying, recording, or otherwise, without the prior consent of the publisher, except that the official electronic file may be used to print single copies for personal (not commercial) use. In many places throughout this book we will have occasion to refer to a computer's internal machine language. The machine we use is a mythical computer called "MMIX." MMIX pronounced EM-micks - is very much like nearly every general-purpose computer designed since 1985, except that it is, perhaps, nicer. 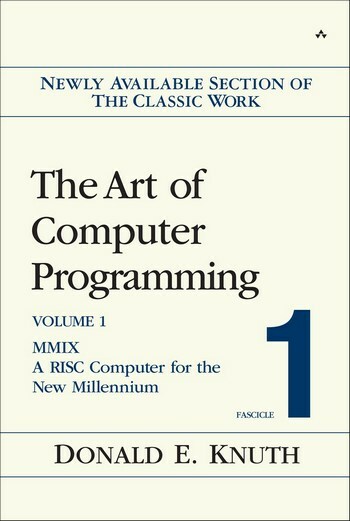 The language of MMIX is powerful enough to allow brief programs to be written for most algorithms, yet simple enough so that its operations are easily learned. The reader is urged to study MMIX carefully, since MMIX language appears in so many parts of this book. There should be no hesitation about learning a machine language; indeed, the author once found it not uncommon to be writing programs in a half dozen different machine languages during the same week. Everyone with more than a casual interest in computers will probably get to know at least one machine language sooner or later. Machine language helps programmers understand what really goes on inside their computers. And once one machine language has been learned, the characteristics of another are easy to assimilate. Computer science is largely concerned with an understanding of how low-level details make it possible to achieve high-level goals. One of the principal goals of Knuth's books is to show how high-level constructions are actually implemented in machines, not simply to show how they are applied. The author explains coroutine linkage, tree structures, random number generation, high-precision arithmetic, radix conversion, packing of data, combinatorial searching, recursion, etc., from the ground up. Donald Ervin Knuth is an American computer scientist, mathematician, and professor emeritus at Stanford University. He is the author of the multi-volume work The Art of Computer Programming.